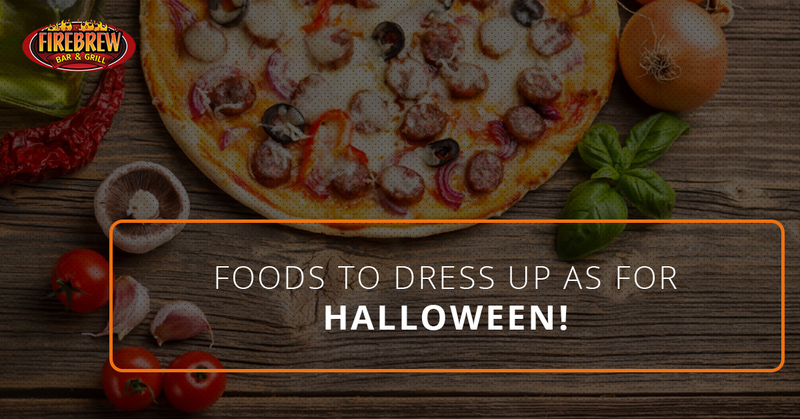 Foods to Dress up as for Halloween! Some excellent Halloween Costumes to try! Happy Halloween, my friends. It’s that time of year again when people decide to dress up as things like kitty cats, evil monsters, pop stars, puns, and, of course, a person who doesn’t care about offending an entire race, culture, or religion so as to trick innocent homeowners into giving them candy. We’re totally cool with this (usually) as long as you share some of those tasty goodies with our restaurant in Virginia Beach. I mean, really, when was the last time you got a bad meal from us? Never. Actually, now that we think of it, our foods are so good that they’re probably Halloween costume worthy themselves. If you’re one of those procrastinators who hasn’t put together their costume, we’ve got some solutions for you. Here are some tasty Halloween costumes to try out this season! Nothing says Halloween like pizza right? No? Oh, well, here’s a costume to try out anyway. First, purchase a dough-colored shirt and pants. Then, fill a kiddy pool with marinara sauce and belly flop into it. Next, you’ll want to have someone sprinkle the ventral side of you with a mozzarella, parmesan, and provolone. When this is all done, you’ll want to lay out in the sun* until the cheese has melted! Before you leave for the party or for trick or treating, be sure to cover yourself with some red pepper flakes and oregano. Star of Halloween? You bet! *Costume does not work well if it is raining or snowing. In the case of bad weather, use a blow dryer to melt cheese. Do not go into the oven. We have many delicious and gourmet burgers at our Virginia Beach restaurant, so you have a variety of options. Start by choosing a marinade. Once you’ve made your choice, fill your bathtub with the spices and sauces and soak in it overnight*. The aroma of your skin is what is really going to make this costume pop. After a night of marinating, find some glue (unfortunately, most condiments don’t have the same adhesive properties as glue, so we’re going to make an exception), and pour it over the clothes you plan on wearing. Quickly sprinkle some lettuce, pickles, onions, and tomatoes over the glue. After putting on the outfit, slice the loaf of bread of your choice in half—you can’t use two normal slices because you’re most likely larger than the average patty—and stick one half in front, one half in the back. Warning, you may want to eat yourself. *Be careful with spicy marinades, they could be irritating. This costume is for people who take Halloween more seriously than their mother’s birthday, and it’s not recommended for the faint of heart. Citrus salmon is one of the most popular dishes at FireBrew, and that’s because our fish is extremely fresh. You’re going to want to find a boat, sail the deep blue sea, and post up for a few months in the middle of the ocean. Before you leave, only pack citrus foods to consume. This will a) prevent scurvy, and b) give you the yummy citrus flavor that this dish boasts. Get to know the waters, become an ocean-dweller yourself. You can’t be a fished served at our restaurant unless you’re fresh from the sea. After you’ve become a piece of the sea itself, return to land. Pour some mango salsa over your head, stick on some avocado, and release yourself into the world. Win all the costume contests. Happy Halloween! For added inspiration, be sure to check out our yummy menu and stop into FireBrew Bar & Grill today!